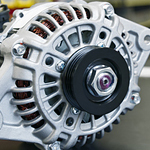 The alternator is an extremely important piece of equipment in your vehicle. The alternator powers the electrical components of your vehicle, and it supplies charge to the battery, so it can turn over the starter. If the alternator goes out, your car will eventually stop. When the alternator is starting to have problems, you will notice that the interior lights and the headlights are dimmer than normal. You may also hear a high-pitched squeal from under the hood. Your alternator may also start to emit a smell that is similar to the smell of hot or burning rubber. Sometimes, the battery light will come on when the alternator is going bad. If you suspect that your vehicle has alternator problems, schedule an appointment with the service department at Wyoming Valley Kia. The service department can diagnose the problem, and they can provide repairs for your vehicle as may be necessary.